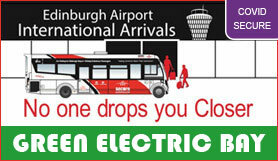 Edinburgh Secure Airparks offers you their fantastic parking facility with the added bonus of a Green Parking Electric Bay for your Hybrid / Electric vehicle. Included you get a wider space, a VIP bay next to the reception area and there is no extra charge for charging up your vehicle. Secure Airparks are the only park and ride service to be able to drop off and pick up at the front of the terminal. Secure Airparks has been in the car parking business at Edinburgh for over 15 years. They have built up a good reputation and relationship with our customers and continue to offer high standards and quality of service.Secure Airparks offers short term and long term parking for Business & Holiday passengers at Edinburgh Airport. Please ensure you bring your charging cables with you. (Standard UK Type 2 Connection).